Customer chooses username, password, price plan (like 7 days Internet) and confirms the identity with a room number and personal details. If successful, Internet is enabled and payment is added on provided room number, and customer will see this charge in your PMS. System can be configured to provide to provide free access (no charge), to apply complimentary plan to member or loyalty guests, or provide list of available plans so user can choose and pay. 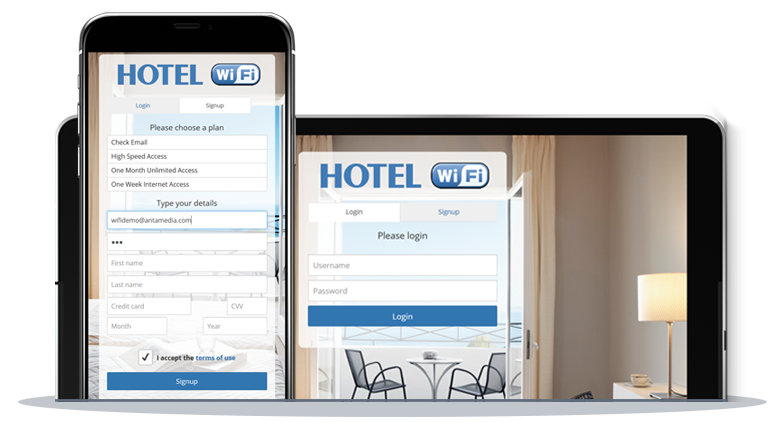 Hotel WiFi software helps you offer free trial Internet access and convert your customers into paid subscribers. Once the customer is satisfied, he can sign-up for the higher level account without restrictions. Ability to offer paid upgrade is very important, as business users or those needing video streaming will not be satisfied with your free-level service. On contrary, users needing only simple services as browsing or Email access would appreciate a free offer, and be loyal to your main services. In-use by major hotel chains for more than a decade, our Hotel WiFi solution is the only high-performace Windows based solution available. We are the only company that can offer both Cloud WiFi and On-Premise Server based Hotspot solution worldwide.